Mike Speed received a Bachelor of Science degree in Industrial Engineering from Texas A&M University and Master of Science and Ph.D. degrees in Industrial Engineering from the University of Alabama in Huntsville. Mike received his Juris Doctorate degree from The Ohio State University College of Law. He has been admitted to practice law in Ohio, the Federal Circuit Court of Appeals, the Sixth Circuit Court of Appeals, the United States District Court for the Southern District of Ohio and Northern District of Ohio. He is also admitted to practice before the United States Patent and Trademark Office. Mike's practice is focused on Intellectual Property litigation. 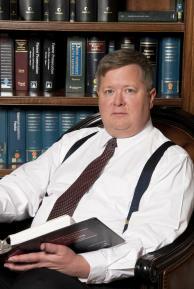 He represents clients in Courts throughout the United States and internationally. He has extensive experience in all aspects of patent litigation including claim construction and Markman hearings as well as discovery related issues and taking matters to trial. Many of his cases have involved multiple patents and numerous claims in a variety of technical areas including the mechanical and material arts, telephony, financial transaction systems, and other computer related and software based inventions. When appropriate, Mike has negotiated favorable settlements for clients and has secured licenses as a result of many of those settlements. In addition to patent litigation, Mike represents clients in trademark, service mark and copyright enforcement actions and defends clients accused of infringement. Prior to his career in law, Mike was employed as a Manufacturing Engineer for the U.S. Air Force and a Professor of Statistics at Texas A&M University. He has published and presented several technical and legal articles, including some related to experimental design and the use of quantitative analysis in litigation.